I received this email today, and it pushes a variety of my buttons. First of all, you need to understand that Destiny is one of those games that you can not complete on your own. This idea has been common in MMoRPGs for a long time, and Destiny uses many of the common play styles from these games (repeatable boss fights with raid groups, team competitive multiplayer, cooperative level completion, etc). For a subset of these activities, Destiny provides a matchmaking service. I say what I want to do, and I sit in a queue until I am matched with other players, and then we (three to six complete strangers) play together to complete the mission (usually a 3v3 or 6v6 multiplayer battle, or a three person boss level). The annoying thing about this, is there are certain activities (most of the end-game content: the newest multiplayer and all raids) are only playable if you play with your friends, and matchmaking is disabled. So to play, I need to convince two friends, who have Playstation 4s (multiplayer is not cross platform), Destiny and all of the expansions (around $120) to play at the same time as me. I have found this nearly impossible. Sure, I could go on Reddit, and pick random strangers to play with me, but I've basically assumed that all end-game content is not open to me because I'm a casual gamer. This is fine, it's something I've lived with. I don't get the coolest gear, I don't see the apparently amazing content, I just enjoy the game. I good FPS with beautiful levels. This email kills me though, because it's basically Destiny saying "Hey, we won't match you with people, but here are places you can go to to do the work yourself". And then, they offer me a trinket that I have no idea what it does (Destiny has a really bad habit of giving you a bunch of random materials that you don't know you need). 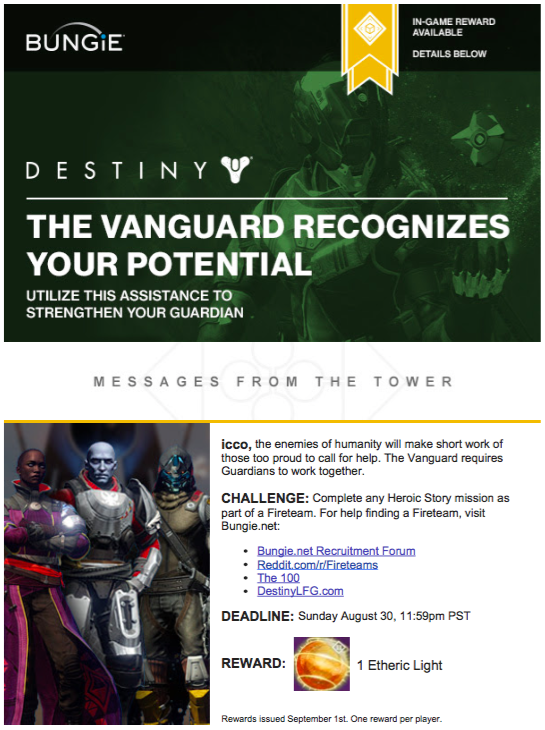 I'm really hoping The Taken King (the next expansion) implements matchmaking for all parts of the game, or Bungie at least figures out how to provide better carrots for their emails. New version of Ruby out, and a reminder on how to best compile Ruby on your mac machine.